Charming seaside villa, 4 bedrooms, 5 min walk to the beach. Villa Paloma is 5 minutes walk from the beach, 5 minutes from the city center. The house originally styled "Basco Landaise" has been completely renovated and transformed. It is surrounded by a large garden (980 m2) with trees out of sight. The place of life is articulated around a patio and its swimming pool in open sky. The living rooms overlook the inner courtyard. A passageway, a large wooden terrace, a covered summer dining room, can take meals in the shade while enjoying the nature. the main house is composed of a large living room with a fireplace, a large kitchen and dining area. 3 bedrooms, two of 20 m 2, two bathrooms, one with a walk-in shower, another with bath. two toilets including an independent. A fourth bedroom with a bathroom, walk-in shower, and toilet and a courtyard make another set overlooking the patio. Equipment and quality bedding. Table linen (tablecloths, cleaning products and necessities are provided. We offer the rental of linen for bedding as well as for the towels by way of the services of a laundry. Thank you to make the request in advance. We also offer our tenants the services of professionals (surf lessons, yoga classes, bike rental. The three bathrooms are equipped with high-end materials and supplies 3 toilets including an independent. We offer our guests during their stay, the services of a maid, as well as a babysitter on request in advance. We also offer personalized surf lessons, or in group, yoga sessions for adults and for children at home. Bike rental . Très belle villa, bien équipée et très propre. Accueil très sympathique de la propriétaire. Une ambiance cosy au milieu des pins qui ne peut que donner l'envie d'y revenir. Cette magnifique maison a été rénovée avec goût. La distribution autour du patio a un charme fou. La maison est bien équipée et surtout très bien située. Proche de l’ocean et du centre. Nous étions en vélo ce qui était encore plus simple. 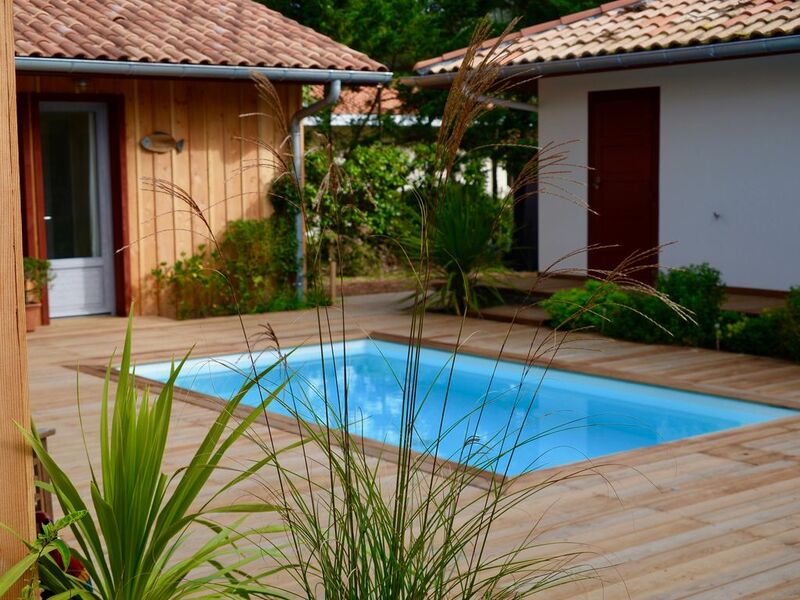 La seule information a connaître est que le piscine n’est pas sécurisée. Il faut donc la bâcher si vous avez des enfants en bas âge, ce que nous avons fait sans difficulté. Nous recommandons cette villa au charme fou! Ganz tolles Haus und super Kontakt! We would rather not tell anybody about this house, to keep this our secret 😉�😊�. This place is beautiful, newly (and well) renovated, with a lovely garden, a nice pool and for colder days central heating. The owner has a good taste of interior design and green fingers. The kitchen is well equipped (all new stuff) and our kids loved the hammock and table tennis! The separate little house where one (2-persons) bedroom with bathroom is located feels very cozy and luxurious. The covered terras provided shelter for sun and/or wind for nice outdoor lunch and dinner. The owner showed us around at arrival and said goodbye at the end, very friendly and she spoke good English. She recommended us a nice restaurant at the beach in Messanges, which we visited the last evening of our stay. The walk to the nice surf beach and sea is only 5 minutes and to the center and lake takes 10 minutes. We truly enjoyed our stay and hope to be back soon! Villa Paloma is ideally located for enjoying all the seaside activities.